PARK INN DAVAO’S RBG Bar and Grill never ran out of delicious and fun ideas when it comes to satisfying their patron’s gastronomic cravings. Earlier, they’ve launched the ever successful and most sought-after SuperSize Meals. And this time around, they’re giving their patrons more reasons to celebrate the spirit of bountiful harvest, Kadayawan by doing an exciting twist to the SuperSize Meals. And what could be more exciting than experience it - Boodle Fight Style. In the beginning, I really thought its quiet odd to be eating boodle fight style in a tasteful resto. But when I tried it myself, believe it when I say, now, I’m brushing that idea off. It’s a refreshing dining concept to loosen up a bit and have fun at the table - eating on banana leaves (you have an option to use a plate though) and eating with your bare hands and care nothing about utensils is exceptionally pure bliss and carefree dining experience. So what are we waiting for, get your hands ready! Ladies, hairs up! Let the boodle fight begin and let’s eat like no one is watching! Grilled Vegetable Salad with Chevre Cheese, Kinilaw with Pomelo Salad, Tinolang Manok Soup, Grilled Squid, Fried Crablets, Grilled Tuna Belly, Chicken Inasal, Grilled Shrimp, Crispy Pork Belly, Lumpia, Pancit, Special Davao Cake, Fresh fruits. All served with plain and garlic rice, plus a pitcher of drink. If you’re not eating pork, you can request to double the portion of your chosen course in lieu of the pork. 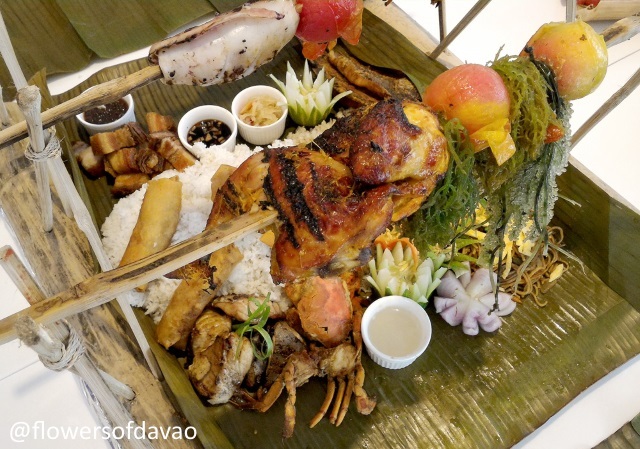 This set includes Grilled Squid, Fried Crablets, Grilled Tuna Belly, Chicken Inasal, Grilled Shrimp, Crispy Pork Belly, Lumpia, Pancit and the freshest Davao ‘lato’. As you can see, this is a food set of all our delectable Filipino comfort food. They’re best eaten bare hands with family and friends around. Thought this also a good occasion to show your visiting foreign friends for Kadayawan the authentic flavours of home. Kristina "Teng" Collantes , RBG’s beautiful and talented Chef has added new spin to these common veggies. 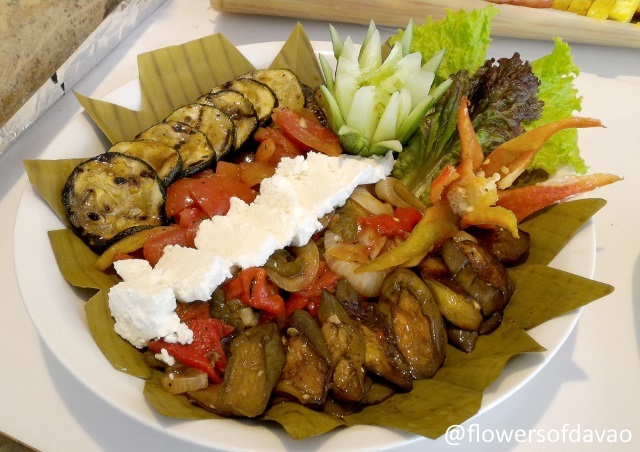 The Davao Chevre cheese has complimented the grilled flavours suggesting you can live with just these veggies alone. They’re truly appetizing. 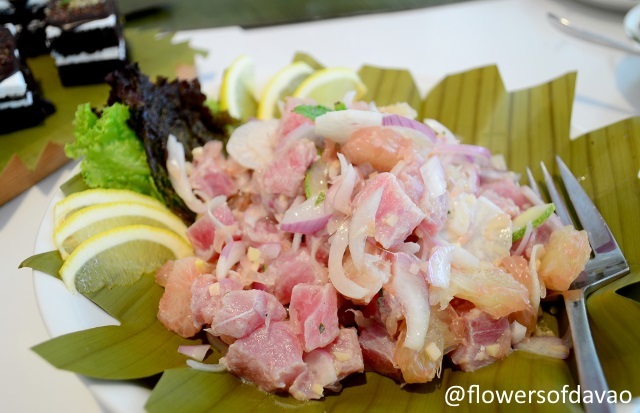 What’s a Filipino comfort food without Kinilaw? 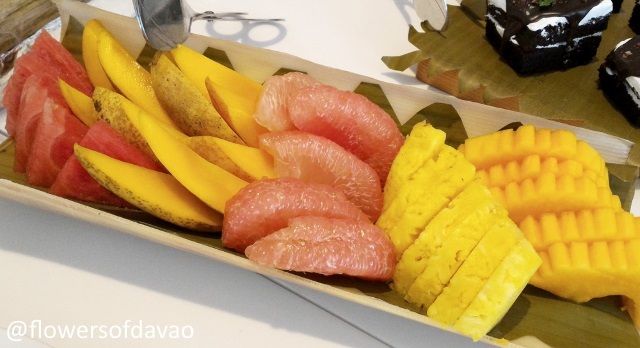 And RBG’s version with Davao pomelo on it is always a delightful hit! Superb! 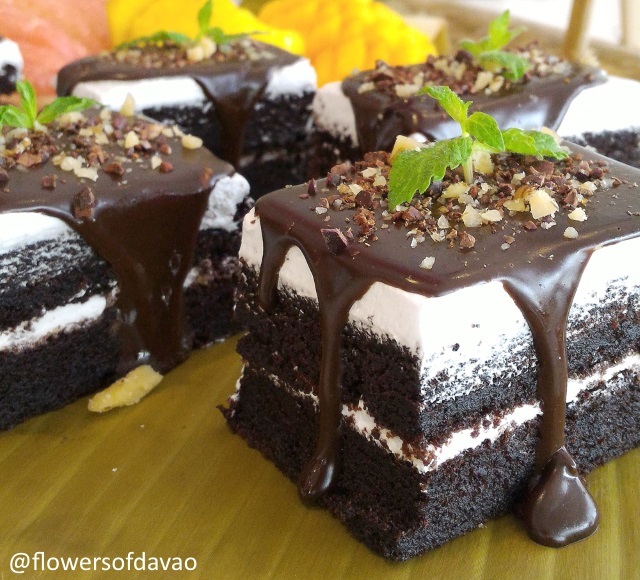 This Special Davao Cake is a soft-baked choco decadence that melts in your mouth like heaven. The supple filling has a hint of durian making it truly Davao. 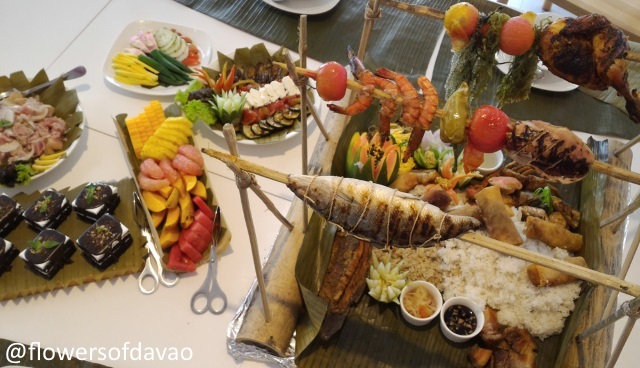 KADAYAWAN Supersize Boodle Fight Meal is only Php1,999 net for 6-7 persons. This is available daily, Lunch and Dinner from August 15 to 31, 2015. So when find yourself in Davao and you want to experience the best of the city’s local cuisine and want to eat to your heart’s delight without reservations and qualms about diet regimen whatsoever, then, RBG is the place to be. 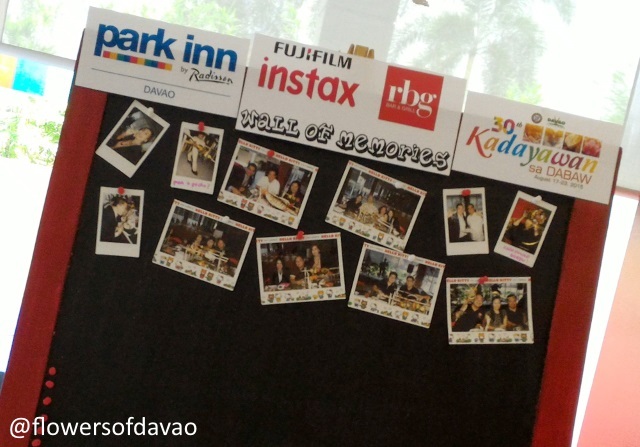 Park Inn Davao also partners with Fujifilm Instax Philippines for an added bonus to your meal. For every group who dines in for the boodle fight gets one complimentary instax photo as a souvenir, and another one for the wall of dining memories. Photos will be raffled off on Sept. 3 and winners will get gift certificate. Feel free to use the hashtags #RBGDavao #SuperSizeBoodleFight #TeamInstaxPh #FujiFilmPh for your photos uploaded on Social Media. Book your table today through Phone No. (082) 272 7600 or email at fb.supervisor@parkinn.com.